Hey, I’m Heather Lickliter Larkin and I’m a portrait photographer in Athens, Georgia. I do portrait photography, family photos, fairytale pictures, and dance photography with ballet headshots. I focus on creating a unique, emotional portrait that will show your personal style and last generations. 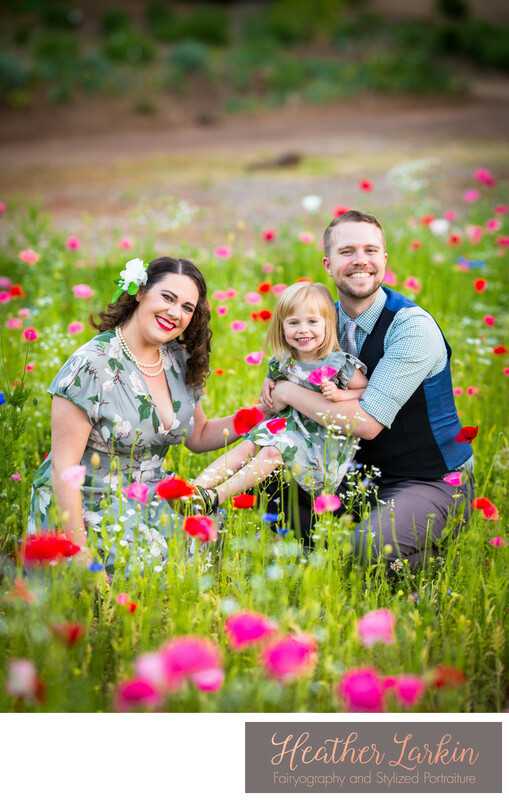 I hope that you can see the connection and love in my photos, and I look forward to working with your family. Read more about me here. Opening in 2004, Stylized Portraiture has provided professional photography for the Athens, Watkinsville and North Georgia area for over 15 years. I’ve photographed hundreds of families and children over the years. 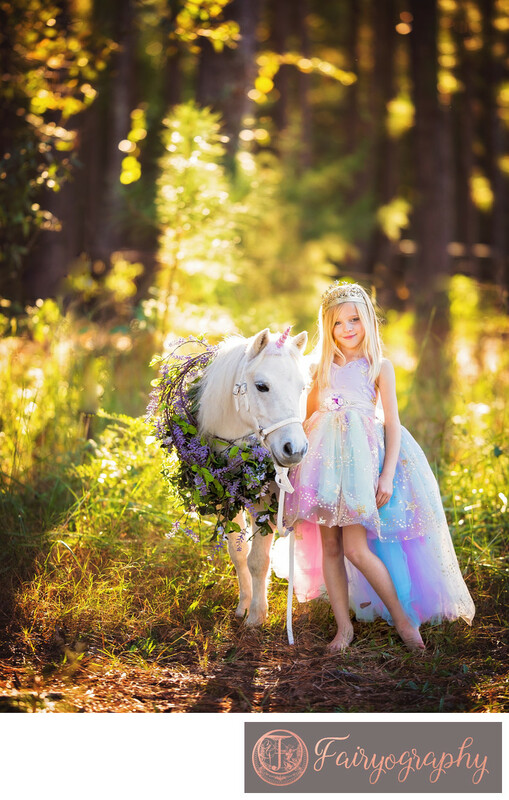 I wanted to add a more magical feel to my pictures, so I added the Fairyography brand as an offshoot in 2006, providing fairy tale photos to make girls' dreams come true. I also began the Memorial Princess Sessions, which are not-for-profit sessions for girls who deal with medical or genetic hardships. In 2018, I added dance and fitness photography in the studio and downtown for a more urban and modern feel. Over all of these years, my focus on vibrant color, quality images, stellar customer service, and the most amazing products on town has not changed. I am thrilled to be able to offer you the absolute highest quality prints, frames, and albums. I even love my albums so much that I taught for the company at the photographer’s convention Imaging USA in 2018. I have also taught other photographers at local Athens Photography Guild, the Athens Photographer Collective, and online in various groups and workshops. I’ve also written three teaching articles for Canon Camera’s online learning forum. I’ve been picked up on the Today Show, Good Housekeeping, Scary Mommy, and I have been featured in Professional Photographers of America’s magazine for May 2015, and many other publications. One of the keys in good family photography is a lot of patience. That’s one the things I’m told most often.. that I’m so patient! I was a pre-school teacher before opening my photo studio, so I know how to interact with children. We play stupid games, make silly faces, sing songs.. all while getting perfect pictures. One of the best things I’m known for is getting amazing photos of the sibling connection... even when those siblings hate each other! I also design family photo outfits from your own closet or link you everything you need to buy for your fall family photos. I can also help you find a hair stylist or salon, professional makeup artist, that perfect pair of shoes, or a place to do a dinner date afterwards. I’ve photographed families and kids in several locations in Athens and Watkinsville including the State Botanical Garden of Georgia, historic Downtown Athens, the UGA Founder’s Garden and North Campus. I love fairy photography! I think one of my favorite parts about fantasy photography is that I get to work with some of the prettiest normal girls ever. Add a fairy costume and a flower crown, and it's magical. 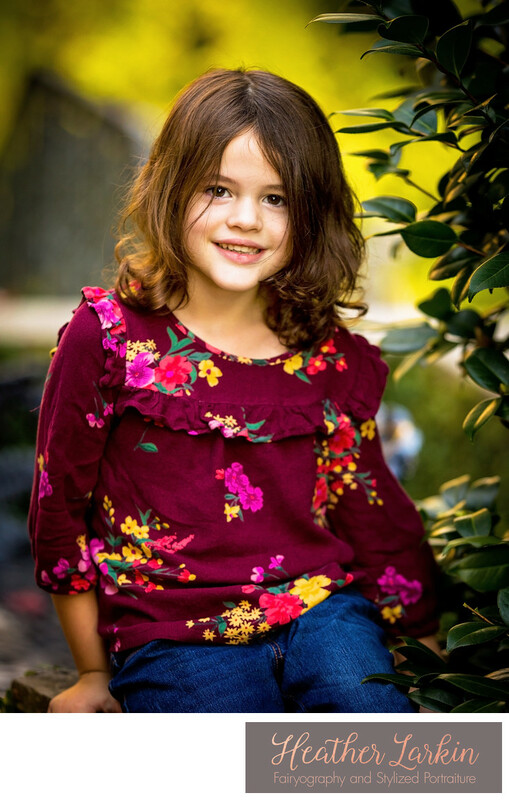 I provide kids couture dresses and wings to my clients for use in the session, as well as going to the salon before the shoot for hair and makeup. Running a children's portrait studio is a very hands-on job. I build or craft a lot of my own props for shoots. I built an 8ft moon once. I shot a fairy session for a grandmother who wanted her tattoos shown off. I did a session that included a 9ft skirt, a leaf blower, and two cars. I built a 6ft bird nest with the help of my husband. I started a circle hoop swing trend in the photography world. I borrowed a taxidermy coyote and moved him for a Red Riding Hood shoot. I lost my mind with all the glitter left over from these shoots. I met a mermaid. I tossed a bed in the ivy. I met two Unicorns in Seattle. I cut 300 paper butterflies and hung them in trees. I made an entire outfit from paper once. I made 6ft fairy wings once. I met Merida from Brave. I built a steampunk Cinderella. I hung jars full of flowers from trees. I use some purple smoke grenades in a treasure box.I put my heart and soul into these shoots, and I think it shows. I’ve photographed in several locations in Athens and Watkinsville. The State Botanical Garden of Georgia, the UGA Founder’s Garden and North Campus, Ashford Manor in Watkinsville, and Thomas Orchards. I’ve done photos for clients in Athens, Watkinsville, Jefferson, Winder, Winterville, Bogart, Statham, and Oconee. I also have clients that range into Atlanta in the suburbs of Decatur, Peachtree City, Fayetteville, Norcross, Marietta, Woodstock, Kennesaw, and Alpharetta. I also do travel portrait photography in Seattle, Portland, and New Orleans. Your mother has been hounding you for photos of her grandchildren, or maybe you've got a dancer just getting her first pair of pointe shoes. You want to show the love and connection your family has to each other in photos? Maybe your one year old isn't so much of a baby anymore and you need to hold on a little longer? Whatever your portrait needs, you know it's hard to pick the best! Families, children, babies, dancers, or fairytale photography, I promise you it's easier on your end than it looks. From booking online with an easy form to family clothing recommendations to the best locations to go, I have it all covered for you. 2. Shoot outside or in the studio! I know, you're worried. You're thinking "But my son is wild and I know he won't sit still for photos!" or maybe you're thinking "Oh my gosh, I know my girl is amazing but she's so shy she takes a while to warm up.. will we have time?" Yes, I promise I know. Sessions are SO FUN and I’m often told at the end of the session that the giggling kid that I was just with for an hour on a stroll through the gardens is usually super shy. Not with me! I went to school for Early Childhood Education so that I could work in preschool. I am crazy silly and super patient. I ENJOY being with your children. I speak TO them like people. You know you need photos, but how to display them? Maybe you've already had what you want to go home with in the back of your mind for a while. You'll come back to the studio for the reveal of your images. See them all large on my studio TV screen and get my professional recommendations about which ones will go well together. You'll see a pre-design of an album so you know what it will look like laid out, no guesswork needed! Of course, you can change anything you want, but it'll be super easy for you to see it all.